The initiative began internally where #StarGrowers were identified as part of National Workplace Wellbeing Day. Then the real work started when ten Community Groups around the country were given access to their own GIY@Work programme and “seed” funding. Plus the hands on support of 50 HEINEKEN Ireland volunteers helped out across three of these communities that were selected as “Star Gardens” – Blackpool Plaza in Cork, St Michael’s Community Centre Inchicore and New Street Garden Waterford. 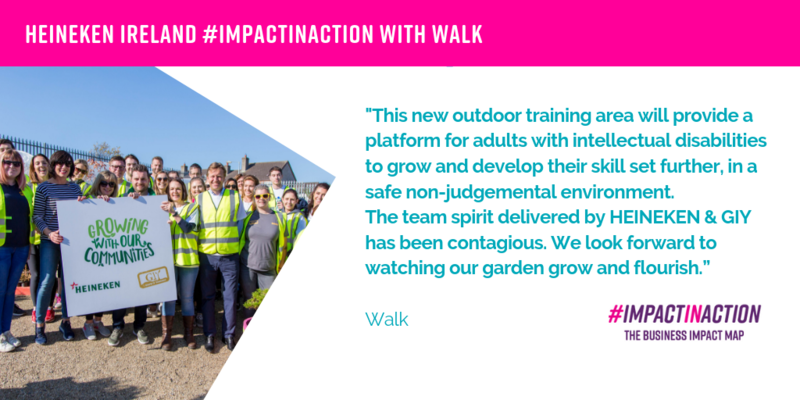 In 2018 the project grew too—involving Walk in Dublin and Field of Dreams in Cork, not only with the financial and human manpower to create functional growing spaces but also in an innovative Skills Sharing workshop where expertise from across the business was brought together to share knowledge and experience in an impactful way. In total the Growing with our Communities pillar at Heineken Ireland has helped over 50 local community and charity groups and contributed €480,000, in 2018 alone. “We would like to sincerely thank HEINEKEN Ireland and GIY for kindly giving us a generous donation as well as their precious time to help transform and convert a wasted space into a new wonderful outdoor training area and sensory garden.